You can display markers, polygons, and polylines on a layer and can style each of these as you wish using the options supplied to the API call. An example of the code to do this is available here. 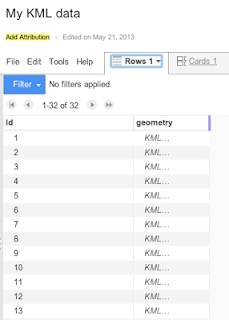 Styles can only be applied to a single Fusion Tables layer per map. You may apply up to five styles to that layer. I recently ran into this limitation when trying to overlay two separate (complex) data sets. For my use case, I wanted to show data from two different Fusion Tables with two different styles, which means I was out of luck. I tried a number of workarounds to avoid this (seemingly odd) limitation. 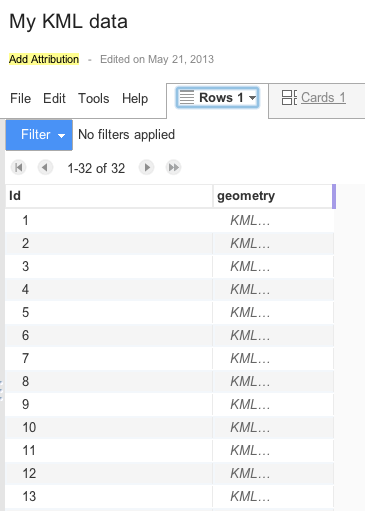 I attempted to combine them into the one table, but the queries don't allow OR statements, I then tried using my own KML file, however that came out larger than 1MB, which loaded very slowly, whereas the Fusion Tables layer handled that data with ease. 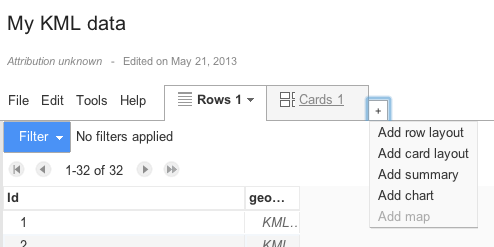 I then attempted to add styling information to the KML file before uploading it into the Fusion Table interface (as KML supports this), however the upload process strips that information out. It was while searching for a way to get around this that I found the solution. I discovered that in the Fusion Tables interface you can add your own map, style it there, and it will give you code to easily embed it. 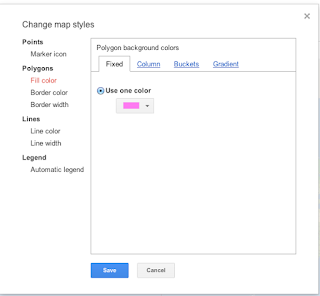 This is designed to allow those without coding skills to style and embed a map on a blog or web page. Great! I thought, a bit annoying that I have to store that information in an external dependency instead of in my own code in source control, but at least I can solve this problem (I could perhaps use the Fusion Tables API to set this style from within my application, at the cost of a few HTTP requests). There's no mention that I could easily find on the page explaining why it was greyed out, but I had a hunch. Given how terribly Google has dealt with Google Apps accounts, I figured that seeing as I was signed in with a Google Apps email, it might have something to do with that. Signing into my personal Gmail revealed that my hunch was indeed correct, I can add a map (you may need to give that account write permissions or copy the table to your personal account). 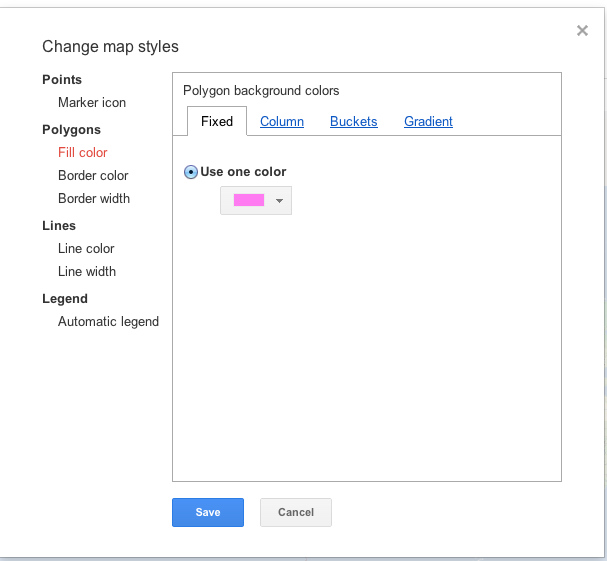 Once you've added a map, tools > change map styles will let you style it. 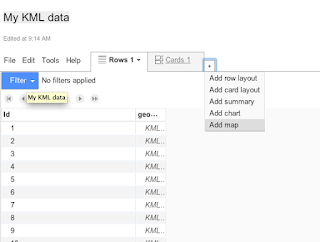 You're note quite done yet though, simple embedding this table into the API won't do it, you need to tell the API which style and which template to use in your map. There's some documentation on getting the style number and setting it in the Maps API here. 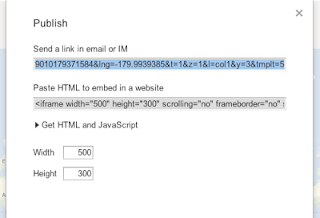 I couldn't find an easy way to get this Id from the API, but it's probably a small number if you just want to try numbers up from 1,2,3,4 etc. 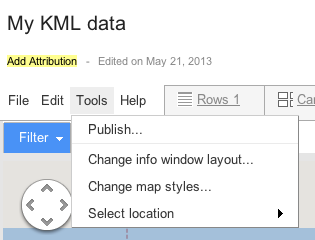 Next you need the template ID, which you can find by clicking on the map tab's dropdown and clicking publish. 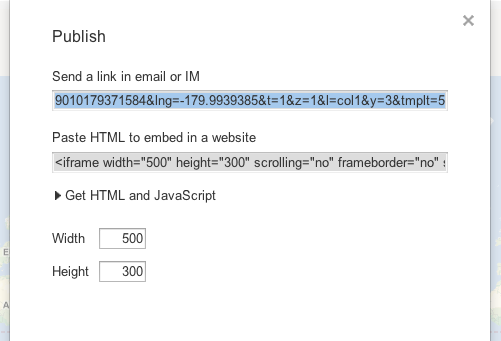 At the end of the URL the querystring will have the template ID as 'tmplt'. 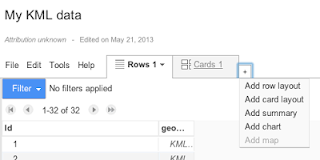 You should them see your styled map embedded in your page. Simple... right?